Simplify the stuff while Traveling! The FREEDOM of one bag, one book, one purse, one list, one purpose! One is enough. Time to take a trip! Whether it is just you or a group, juggling all the stuff can be overwhelming. Why do we buy into the belief that more is better? When traveling, this outdated idea only causes trouble. We are inviting you to experience the freedom that comes from choosing just ONE! Decide on one suitcase that is just the right size to hold your essentials and no more. I tried this approach on my last trip and I was blown away at how much simpler EVERYTHING was! I had one perfect size suitcase, one over the shoulder purse, one book, one notebook, my iPhone, one list, and one friend to visit. Digging in the dirt takes us right back to being a kid. There is nothing else like it. When Spring comes, our hands start itching to go digging in the dirt. For thousands of years spring’s arrival meant it was time to till and plant. This primal instinct is wired into us. We need this time with the earth. It is healing unlike anything else. So we feel ourselves called outside, driving to the plant store and co-creating with mother earth. But like everything else in life, the project of planting can feel overwhelming, especially for someone like me. I am not a born gardner like my daddy was. He started each day outside, wandering through his yard and garden, picking weeds, talking to the plants and digging in the dirt. He could get things to grow that no one else could. He had a way with the earth. Growing up I wanted to work alongside him and learn but it felt overwhelming. Sadly I never did. As an adult, when spring arrived, I would have the urge to go plant but didn’t know where to start. So one year I thought why not start small. I started with one pot on my front porch holding one plant. I let myself enjoy this sweet & simple ritual. Then everyday I was greeted by the bright flowers when I came home. Overtime this has grown to a flower garden in front of the house and more in the back. Just getting ready to write this blog, I had to go get new plants for our new office. This spring let yourself go dig in the dirt and take in how fabulous it feels to your body and spirits. Tip #5. Donate in alignment with your values. Donating your stuff, your time and resources to a cause you care about is FREEING. Why would we fill up our cars with our client’s donations? Because letting go of our stuff and deciding where to donate our resources are loaded decisions. We want to make it easier. We have seen over and over again that when our clients choose an agency or cause they really care about the letting go is easier. We define clutter as delayed decisions and holding onto the past. We are asking you to help your family and loved ones find a place to donate and a cause to contribute to. Please see the list below for ideas on places you can support. We are sharing our chosen cause below and would appreciate your help. The Utah Professional Organizers are donating 200+ hours of our time and skill. 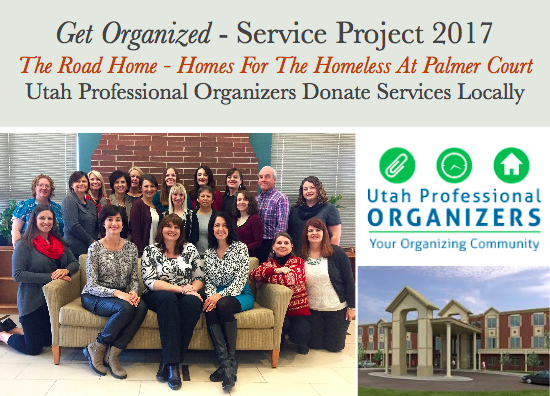 The Utah Professional Organizers are excited to help The Road Home organize supplies, donations, and storage closets at Palmer court. This wonderful organization helps find permanent housing for homeless individuals and families in our community. We need donations to make this project a success! Everything helps. We have found through the years that donating stuff, time and money to a cause you care about makes a big difference. We would greatly appreciate your help in this transformation. Please go here to make a monetary donation. Or if you want more information about the Utah Professional Organizers go here. Here are some additional links for national agencies that will make it easy for you to let go of the stuff that is keeping you stuck!